“Battle-proven…in over 40,000 successful combat missions.” This boast appears in a promotional video for the Hermes 900 series drones. It’s a frequently repeated phrase used by the Israeli weapons company Elbit Systems to market its military products. Elbit Systems, one of Israel’s largest arms companies, showed this video at the Farnborough International arms fair in the midst of Israel’s bombing of the Gaza Strip in 2014. Elbit does not shy away from talking about the death and destruction its weapons cause. In fact, the company has sought to capitalise on this ‘proof’ that its weapons would be a good purchase for governments like the UK. That ‘proof’ was over 2,200 Palestinians dead and more than 100,000 left homeless, with over 9,000 houses totally destroyed. Israel’s war on the Palestinians, alongside increased conflict and repression around the world, has meant more profit for Israeli arms companies, exporting to the US (where Elbit has been contracted to fortify the border with Mexico), Brazil, India and beyond. In July 2016, on the two year anniversary of Israel’s last major attacks on the Gaza Strip, Elbit announced that it is poised to expand, making explicit that the Brexit vote will not stop it from seeking new opportunities in the “strategically important” UK. 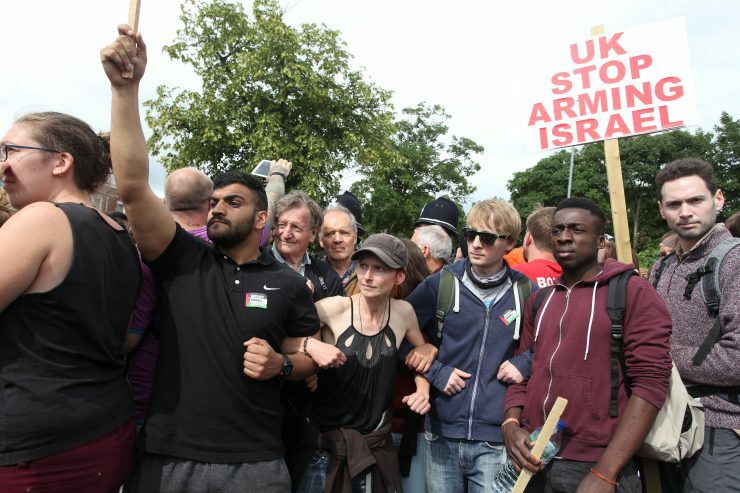 But Elbit is sure to run into difficulties expanding in the UK, as Stop Arming Israel campaigners have already given the company a run for its money over its operations here. All content and downloads licensed under the Creative Commons Attribution-ShareAlike 4.0 International License unless otherwise stated.